"To enter the same level of excitement as us for this release, we advise you to push play and listen to Harder, better, faster, stronger, by Daft Punk while reading this blog post. – 30% more video conference time on battery thanks to battery savings! – 30% less CPU usage when using video pop-out through hardware acceleration! In addition we have added many smaller improvements to performance, and continued improvements to our key features. Starting the browser should be very fast. However, until now, if you had many tabs open in your last session, the browser would start loading all of them at the same time. This could mean slowing down the browser. With Opera 41 we’re working on optimizing browser startup time, with the most recent active tab and pinned tabs being prioritized for startup, while background tabs will be loaded with decreased priority. 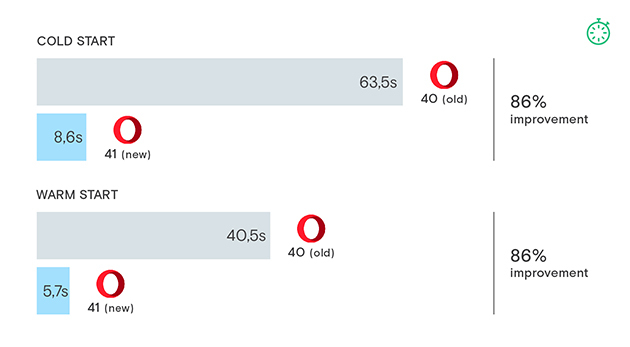 The test results show, that Opera 41 is about 48% faster than Opera 40. The test was performed with 10 tabs open in the session saved in history. An Intel Core i5-5200 – 2.20GHz with SPCC SSD 120GB and 8GB DDR3 12800 (800MHz), running Windows 7 64-bit was used. Time was measured until the active tab appeared and could be used. A cold start means your browser has not yet been open since restarting the operating system. A hot start happens, when the browser has been closed, and without OS restart you are launching browser again. It’s usually faster, than cold start, since some needed libraries might still be in RAM memory. When using battery saving mode, Opera now detects which video codec can be hardware accelerated, and tries to choose that codec, when doing video conferencing via WebRTC (this includes services such as Google Hangouts). This should save a lot of CPU, and battery for our laptop-using video-conferencing hobnobbers out there! And even if Opera can’t find a hardware-accelerated codec, Opera will now try to limit the pixel count, when in battery saving mode to reduce CPU usage if possible. The test was run on a Dell laptop, equipped with an Intel i7-4600 2.1 GHz, 8GB of RAM, and Windows 7 64-bit. – Connected to other machine to conference using Google Chrome. Since Opera became the first browser to introduce the video pop-up back in May, the videos displayed has been handled by software. This could cause extensive CPU usage, which again could lead to general system slowdown on low end computers. With Opera 41 we introduce a fully hardware accelerated video pop-out. This should greatly limit the need for CPU support, and free your PC resources to other things, while you watch your favorites movies. The test results show up to 30% less CPU usage after this change. Test run on a Macbook Pro Retina 15 (Late 2013), running macOS 10.12. We’ve launched single tab with https://vimeo.com/97073941, detached the video, and observed the lowest, and highest CPU usage of Opera processes via Activity Monitor for two minutes. – Add source, even if you don’t know exact RSS URL. Just enter page address, and if any feed is found, you’ll have an option to add it. For example: enduro-mtb.com/en/ or pinkbike.com. – More UI changes, including some little animations as well. – Added history navigation, now you can go back to previous view. – Option to preview source before adding, works nicely with history navigation. – Removal of “CUSTOM SOURCE” badge from manually added feeds. It’s too eye catchy, and draws attention away from the title. – Web feed preview. For example, head to http://mars.nasa.gov/rss, and click “All Mars” link. 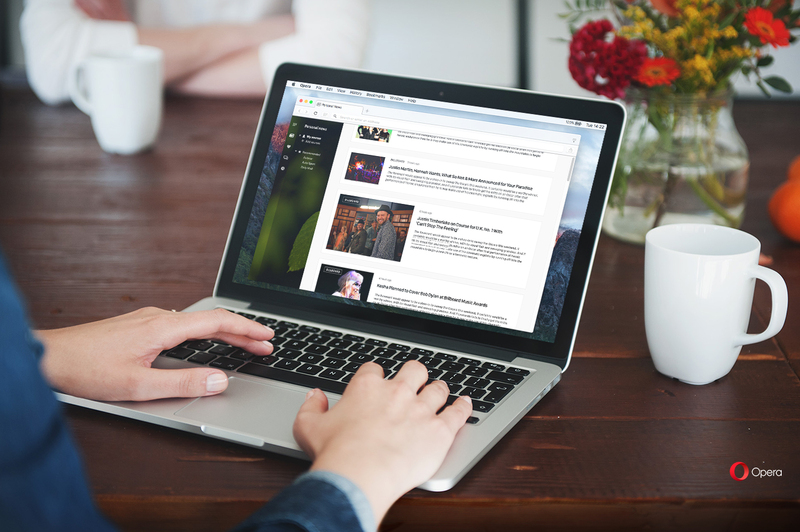 Content will be displayed using layout known from personal news (you can switch between two modes). Moreover, you can also add this feed to your sources. Note: If you have RSS detection extension, you may need to disable it. – My sources configuration stored in preferences, and synced with Opera account. – Due to limited interest, News on SD removed. – Onboarding was redesigned and aligned with catalog. Default view for new users is Top 50. – Catalog includes recommendations listed in a nice fold-able section (state remembered between sessions). 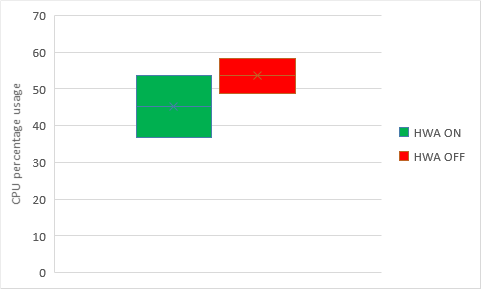 Initial benchmarks test shows, that x64 builds might be faster than x32 version. We are preparing to launch x64 builds in final version O42. In O41 development, and stabilization cycle besides regular browsing, we are also testing, if regular auto update, and installation work well. If you are using x64 version, please let us know, if your previous build updated properly, to recent x64 release. Known issue: after upgrading from O40, where VPN was used, it might happen, that VPN stops working at some circumstances. It can be fixed by clearing the third party services data. Open preferences url: opera://settings, select “Privacy & security”, click on “Clear browsing data…”, ensure to have checked “Third party services data”, and click on “Clear browsing data” button." "Hi, today we’ve got a fresh update on the beta stream. What did we prepare for you? Many fixes to the video pop-out feature. Improved Network Installer on Mac. The VPN functionality now should work even after upgrading from the previous versions. A new bunch of translations has been integrated. Chromium update to version 54.0.2840.50. 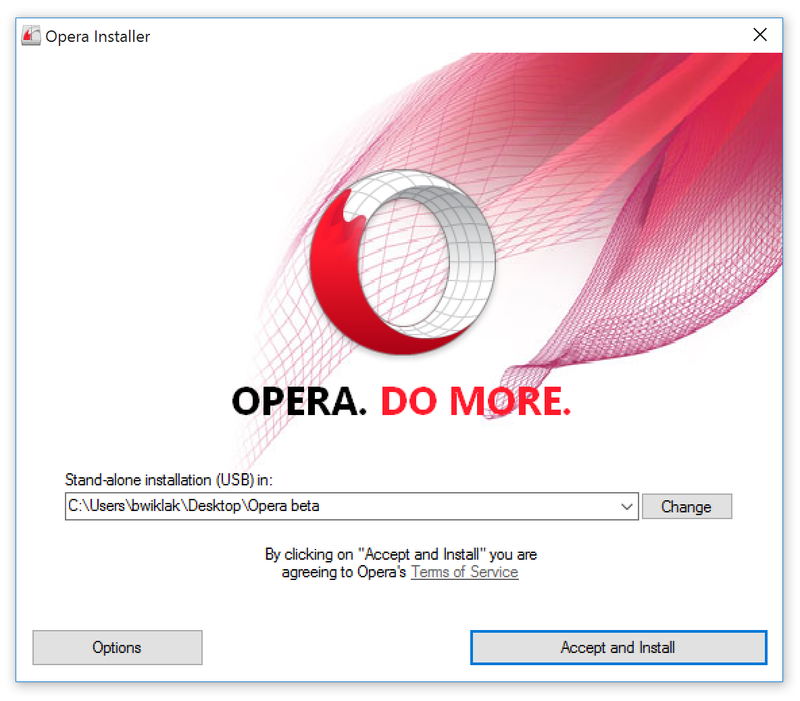 Besides that, we would like to introduce the Opera Portable installer for Windows. Details below. The portable installer provides the stand-alone version selected by default (no need to dive into the Options section), detects portable drives automatically, and suggests installation to these devices by default. The installer is available for download here. Please try it out, and let us know in the comments if it works as expected!" "Hi, it’s time for the Opera 41 release candidate. We hope there are no serious bugs in here, and that you will find this build final worthy. There are some new translations prepared. We also fixed some Mac related crashes. There should not be any problems with speed dial extensions anymore. The change log, and the announcement: Faster and better browsing – Welcome Opera 41. We have a solution for you, that makes your browsing faster: Opera 41 includes a new, smarter startup sequence, that cuts away almost all the wait time, no matter how many tabs you open on startup. In addition, Opera 41 has several other improvements, like longer battery time, when video conferencing, and lower CPU usage for video pop-out. For more than ten years, the Opera browser’s default setting has been to let you start, where you left off. Now, the new smarter startup sequence makes the browser start up faster by prioritizing, which of the previously-used tabs are likely to be most important for you. As such, the most recently active tab, and any pinned tabs will load first, while less important tabs, will be loaded with decreased priority. For most users, this will feel like the tabs are opened immediately, without waiting time. Test results show an average improvement of 86%, when testing startup time with more than 42 tabs open in the previous sessions. For a set of around 10 tabs, the gain is still above 50%. When using battery saving mode, Opera now detects which video codec can be hardware-accelerated, and tries to choose that codec, when doing video conferencing via WebRTC (this includes services such as Google Hangouts). This should save a lot of CPU, and battery for our laptop-using, video-conferencing hobnobbers out there! And, even if the Opera browser can’t find a hardware-accelerated codec, it will now try to limit the pixel count, when in battery-saving mode to reduce CPU usage, if possible. Since Opera became the first browser to introduce the video pop-out back in May, the videos displayed have been handled by software. This could cause extensive CPU usage, which again could lead to general system slowdown on low-end computers. With Opera 41, you get a fully hardware-accelerated video pop-out. This should greatly limit the need for CPU support, and free your PC resources for other things, while you watch your favorite movies. Opera’s personalized newsreader, one-stop news tailored for users’ needs, has received a long list of improvements, including an option to add a source even if the user doesn’t know the exact RSS URL, as well as history navigation, so you can go back to the previous view. Learn more about the long list of personalized newsreader improvements in the Opera 41 beta blog post. Download Opera 41, and let us know what you think about the faster startup, and the rest of the new features." Browser does not cause problems, but I see one thing you need to improve - scaling window. If the taskbar (in Windows 10) is at the top of the monitor, a maximized window is over the taskbar. Other applications do not look that. Let's do something about it? – The bug, where the video pop-out was closed on a different page refresh has now been fixed. – Some other minor issues, and crashes related to the video pop-out have been fixed too. – The weird animation, which occurred during opening a tab with middle-click is no more happening. – There are a few Personal News fixes, including proper management of incomplete pages. The Chromium has been updated to version 54.0.2840.87. Also, as this is probably the last time I have contact with you as the blog note author, I would like to thank you all for all your commitment to help us build a better product. Keep it up, and live your lives as best as you can!" "Today, we are releasing a regular stability update of Opera Stable 41. Chromium was updated to version 54.0.2840.99. We fixed some nasty crash on dragging bookmarks bar elements."